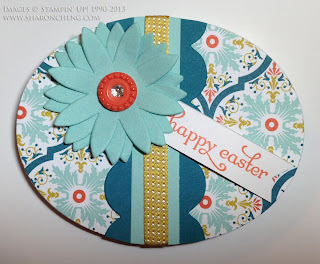 This Easter Egg card was made using Stampin' Up! 's Oval Framelits. Several of the people in my stamp club picked this as their favorite project because it was quick, easy and different from a traditional card. To make the card, I first cut an oval from the Sycamore Street Designer Series Paper in the Sale-A-Bration catalog. 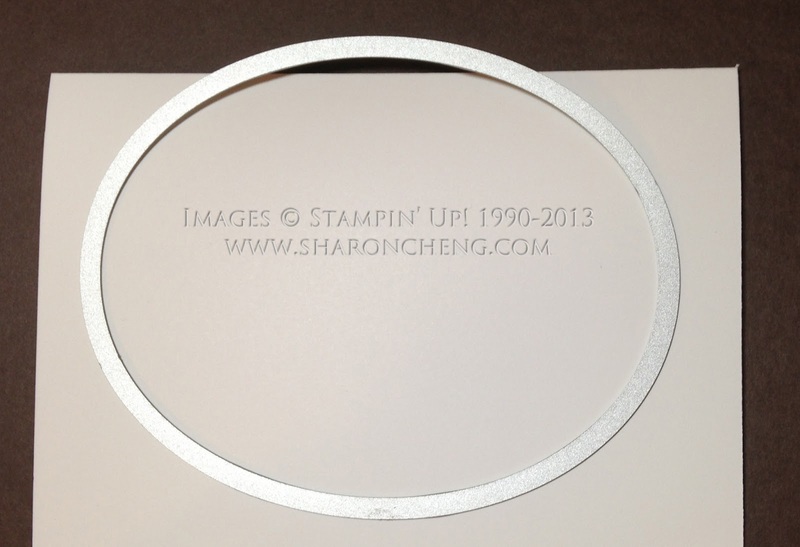 The card body was cut using the same oval framelit (largest one without the scalloped edge). 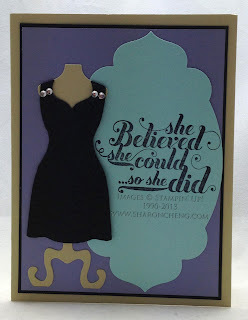 To make the card, cut and fold a piece of Whisper White card stock. Line up the framelit so that one part of the folded edge is inside the oval so it won't be cut. When you run it through the Big Shot, you'll end up with an oval card. Decorate your designer series paper egg and adhere to the card body. The flower comes from Stampin' Up! 's Pop-Up Posies kit in the Spring catalog. This second card was my personal favorite. It's mostly because I love those little bunnies! The Ears To You stamp (132659 $6.95) is one of several single stamps that Stampin' Up! is offering. 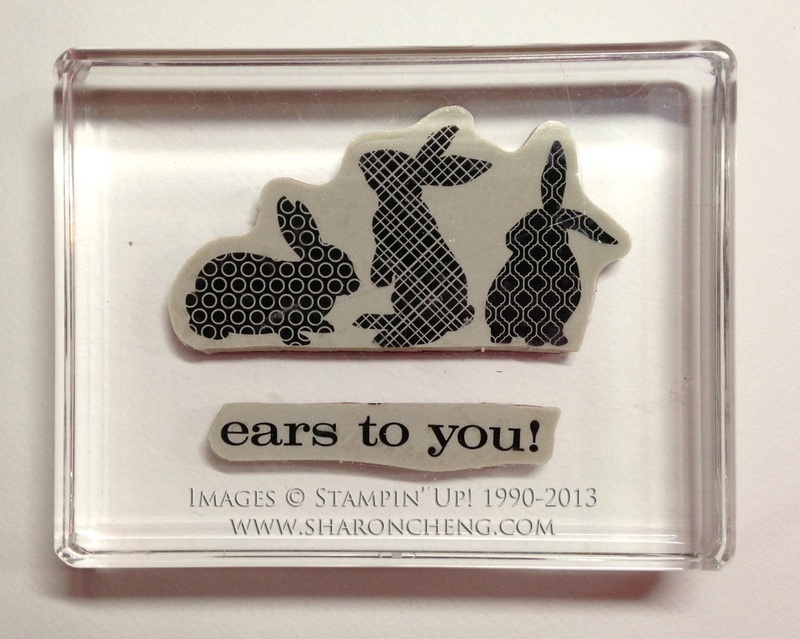 The bunnies are heat embossed with white embossing powder on Stampin' Up! 's Twitterpated Designer Series Paper. When you sponge on Pool Party and Wisteria Wonder, the bunnies stand out from the pink background. One of the things that I like about clear mount stamps is that you can cut them apart and space them out on a clear block. 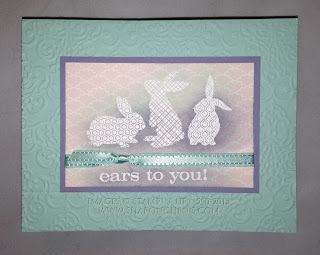 You can see how I cut the sentiment apart from the rest of the stamp to make room for the ribbon. The last card for my February stamp club was inspired by a swap card that I got at Stampin' Up! 's Dallas Regional event. Based on the swap cards I have seen, the Dress Up Framelits have been the most popular framelits from the Spring catalog. I've seen many different versions of the dresses. Everyone in club had fun decorating the dress they way they liked it using the rhinestone jewels. Several people decorated the neckline and one person made a rhinestone belt. That is why little black dresses are so popular. They look different based on the accessories you use! And this is one of my favorite quotes from the Feel Goods stamp set.